The sun was shining out from the clouds over Fairy Lake and, on impulse, I went in that direction. It was chilly and beautiful snowflakes started floating down all around. 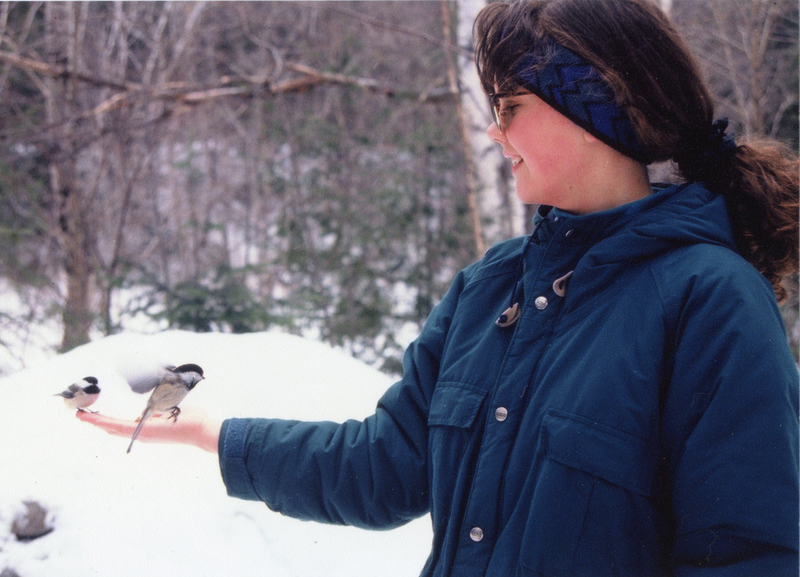 As I was walking down Main St. toward the park, I decided that when I got there, I would watch for any chickadees, birds I’ve always associated with my sister. I also decided to take Kerry with me. I imagined her walking beside me and left space for her on the path. At first I talked to her in my mind, and later when I was alone, out loud. It’s the first time I’ve talked to her in a while. 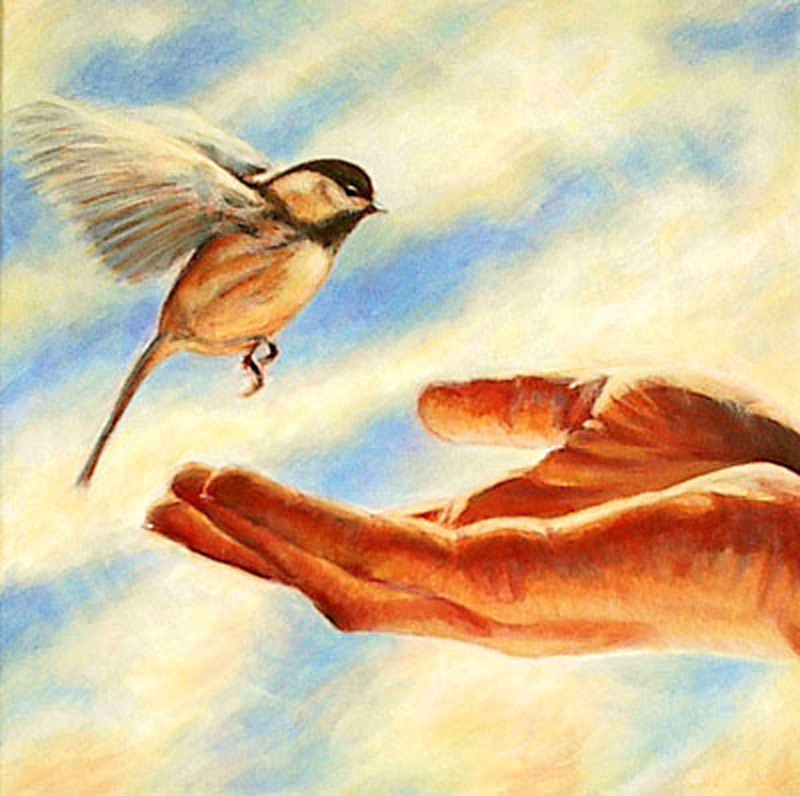 “The Visit,” a painting I did in 2002 based on Kerry’s connection with chickadees. Kerry and I kept walking along, me talking, sometimes with tears. When I came to the bridge and began to retrace my steps, on impulse I took a little side path down to where the river runs over the rocks, wanting to hear its sound. When I turned around, I realized I was in the midst of a beautiful little cedar grove. I’d never noticed it before though I’ve walked this route many times. And here I was, surrounded by these beautiful strong trees. I didn’t have to go all the way to the conservation area to find what I had been looking for. It had appeared to me where I needed it. One of the last photos of Kerry and I, alongside one of her mugs filled with cedar sprigs that I gathered from the ground on my walk “with” her. I received one last gift as I neared the end of the boardwalk. Lying on the wood edging, I noticed a woolly bear caterpillar, still and unmoving. I guessed that it must be frozen, lured out by the mild weather a few days ago and caught in the cold. I didn’t know if it was dead or in stasis but I felt sad looking at it. A snowflake landed on its back like a star, and I saw that its body was surrounded by more lacy flakes. It was so beautiful and sad all at the same time. It was the perfect metaphor for everything I’d been feeling. The pain of Kerry’s physical absence was infused and surrounded by beauty: the beauty of the love I feel for her, all the ways that her life and death have transformed me for the better, the gifts I was receiving—the flock of robins, the cedar grove, the caterpillar—and the beautiful sacred space that opens up when I am willing to be vulnerable and connected to what I carry in my heart. As I walked back out of the park, I took all these gifts with me. May all of you who have lost someone you treasured, find your own ways to create a space for connection and remembrance, ways that are perfect for you, that offer you a bright flash of beauty and a glimpse of grace. 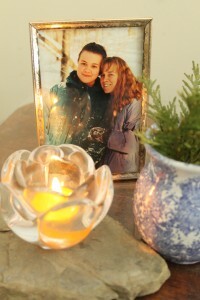 Post Script: Grief is messy and unpredictable. Although I returned from my walk with Kerry inspired and completely exhausted with all I had felt, there was more to come. A series of mistakes and mishaps this evening, after I thought I’d finished this blog post, triggered a whole lot of intense emotions: more sadness and anger than I ever expected, and more than the mistakes themselves warranted. Grief finds its way out when it needs to and not always in the ways we expect, and our challenge is to be gentle with ourselves when it happens. Thank you Janice for your kind words. Thank you for sharing such a beautiful and vulnerable story. I just got back from a walk on that exact trail, and I can perfectly picture the places your path took you and your sister, surrounded by the magical and comforting flocks of birds that do not usually visit us so early in the year – a gift indeed. On my walk, I took special notice of the spot near the water where the rocks peek our creating ripples, in the cedar grove, and I find this comforting that you experienced something so profound there just 1 day ago. I am reminded of something I was told yesterday by a very interesting man who tells beautiful stories; he said, “the role of the storyteller is to make the invisible, visible.” I feel very moved by your story, and by the strength you demonstrate in the midst of grief, to share something that remains invisible to too many of us. Thank-you. Thank you so much Rebecca for sharing your experience on your walk and your heartfelt response to my blog. I absolutely love that quote and it gives words to what drives both my writing and my artwork. Your words mean so much to me. I am full of gratitude.